Join Mark and the Coffee Break French team “en route” in the south of France. 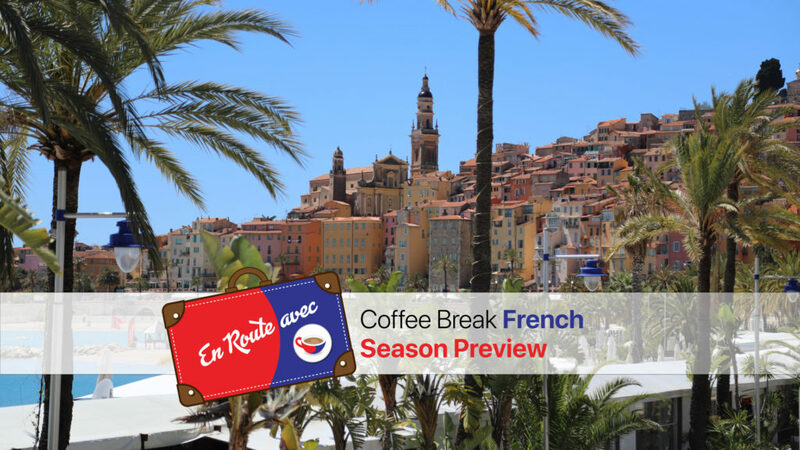 In this season preview, Mark introduces the new show and you’ll hear excerpts from some of the many interviews we’ve carried out in the area between Nice and Menton on the beautiful Côte d’Azur. We’ll be talking to people who live or work in the area, and to people who are visiting the area. These conversations feature authentic French, with a whole range of different accents and speeds of delivery, so it’s the perfect way to improve your listening comprehension. The audio lesson is free, as are all the main audio lessons of En Route avec Coffee Break French. Use the audio player to listen to the lesson, or subscribe in Apple Podcasts to receive this lesson and all future lessons automatically. If you can’t see the player below, click here to access the lesson. I know this will sound ridiculous but now that I have enrolled in the En Route French course where do I go to find the content, please. I have been really looking forward to this course and I am sure I will enjoy it. I have been listening to coffee break french for many years. I just want to take all of you guys and girls for constantly providing great content that has really helped me to improve my french speaking and comprehension.